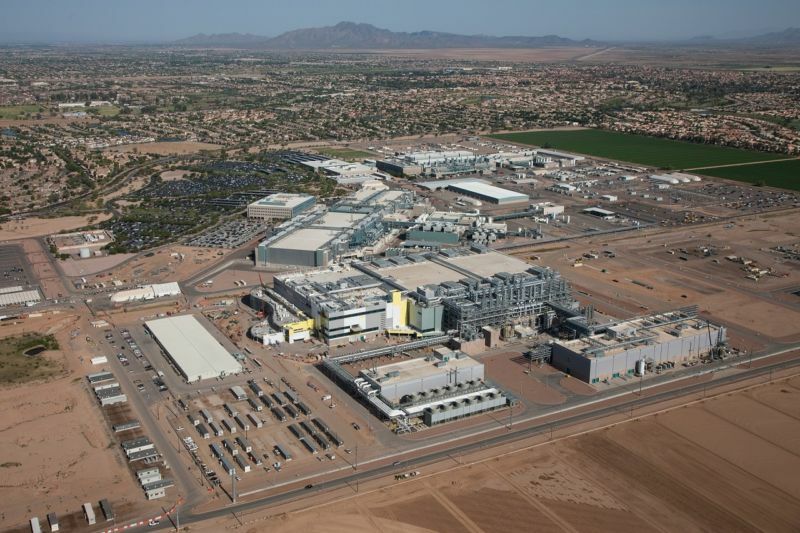 Intel announced today that it would spend $7 billion to complete Fab 42, a factory in Chandler, Arizona that will eventually be used to build chips on Intel's 7nm manufacturing process. According to Intel's release, the facility will "directly create 3,000 high-tech, high-wage Intel jobs for process engineers, equipment technicians, and facilities-support engineers and technicians who will work at the site" and that a further 7,000 jobs will be created indirectly to support the facility. Intel CEO Brian Krzanich made the announcement at the White House with President Donald Trump; Krzanich briefly attracted controversy last summer when he canceled a Trump fundraising event. In an e-mail to Intel employees after the announcement (PDF), Krzanich said he made the announcement at the White House as a show of support for "the Administration's policies to level the global playing field and make US manufacturing competitive worldwide through new regulatory standards and investment policies." Krzanich also noted that Intel is "one of the top five exporters and top two R&D spenders in the US—despite the fact that from a tax and regulatory position we have been disadvantaged relative to the rest of the world where we compete." Though Krzanich bemoans US taxes and regulations, it's also worth noting that US government restrictions make it more difficult for Intel to build cutting-edge chip manufacturing facilities outside of the United States in the first place. Under the terms of the Wassenaar Arrangement, Intel needs to get government approval before it can export manufacturing equipment capable of making anything smaller than 45nm chips (that number changes over time as manufacturing processes improve). This is one reason why Intel only has one factory in China and why that factory was making then-outdated 65nm chips when it opened in 2010. It's not that Intel can't build advanced chip factories outside of the US, but it does appear to be easier overall to keep the most advanced processes in the US. Fab 42 was originally announced back in 2011, and then-President Obama spoke there back in 2012. At the time, Intel expected to build 14nm chips there, and it anticipated the facility would be completed at some point in 2013 (PDF). The main building was completed right down to its heating and air conditioning systems, but in 2014, Intel announced amid a downturn in PC sales that it would instead build 14nm chips at existing facilities in Oregon and Arizona. The 1,000 jobs that the facility was supposed to create instead went to those existing factories. Before today, Intel hadn't decisively commented on the facility's fate, but at the time of the cancellation, the company did say that the building would eventually be used. The original estimate of 1,000 directly created jobs may have increased to 3,000 because of the increased complexity of the 7nm process; Krzanich also notes that the 7nm process will require a greater amount of factory space per wafer. What's not clear is how many of those jobs might be offset by job cuts elsewhere—Intel announced plans to cut as many as 12,000 of its jobs worldwide in April of 2016, representing about 11 percent of its total workforce. Intel also didn't announce a timeline for hiring the new facility's employees. New manufacturing processes take years to get going, and Intel still has to start producing chips on its planned 10nm process before it gets around to making 7nm chips. The time it takes to migrate to a new manufacturing process has also increased since the turn of the decade, taking three or four years where it used to take around two. Fab 42 will be Intel's third manufacturing facility in Chandler, Arizona. Fab 12 opened in 1996, and as of 2011 or 2012 Intel said it would be producing 22nm chips there (PDF). Fab 32, opened in 2007, manufactures 22nm and 14nm chips.